To perform the simulations several test scenarios were prepared in two campaigns in Karlsruhe and Dortmund. The smoke of Heptane (UN 1206/Kemmler 33) was recorded as well as a mixture from gasoline (1203/33) and diesel (1202/30). A gas leakage was simulated at the Dortmund Fire Brigade Education Center using Methane (CH_4; 1971/23). And a gas cloud containing “chemicals” was simulated by a fog machine which nebulized a 50% mixture of propylene glycol (propane-1,2-diol) and chlorophyll from the food branch. Both cameras give the radiometric signatures and not just “colored pictures”. The Images were spatially referenced by standard procedures. It was found that building differences just show intereferences in the pictures (shown in the first row of Picture 1). 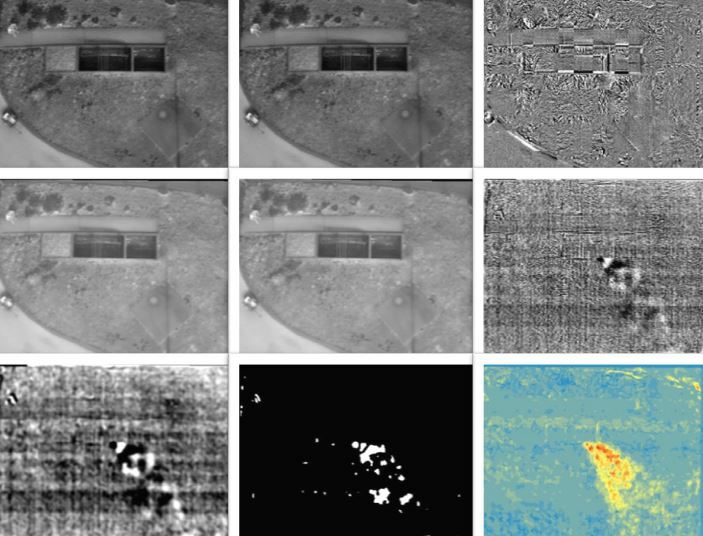 Good results were given by a Halcon referencing based on sub pixel accuracy (row two in Picture 1). Using difference analysis on about 25 pictures show a clear signature of the exhaling methane (row three in Picture 1). The idea of remotely detecting and identifying chemicals using a hyperspectral sensor is not new. The so called Analytical Task Force (ATF1) is using the Van-based RAMAN spectroscope SIGIS 2 to detect and identify chemicals in CBRN incidents. The BigGIS project intended to be more flexible than a SIGIS 2 mounted in a car. Therefore, as a proof-of-concept the implementation of a system allowing for spectral analysis of gas and aerosol clouds mounted on a UAV was subject of study on the level of a proof-of-concept. Due to the fact that multispectral IR-sensors as they are utilized in the SIGIS 2 system require relatively heavy-weight cooling units disqualify these systems for the usage with a UAV. Therefore, within the project a multispectral sensor sensitive in the spectral range of visible light and near IR (450 - 950 nm) was utilized for spectral analyzation. The sensor Cubert 185 UHD Firefly2 has a weight of about 500 g and could easily be mounted on a UAV. Using this sensor “smoke clouds” from a mixture of “Disco fog” and chlorophyll (see below) were recorded. Each pixel in the image contains the spectral information of the reflected light spread over 125 bands ranging from a minimum wavelength of 450nm to a maximum of 950nm. In a first Analysis the propagating chlorophyll cloud was identified in the recorded image via the calculation of the Triangular Chlorophyll Index (TCI) for each pixel in the spatially referenced image. 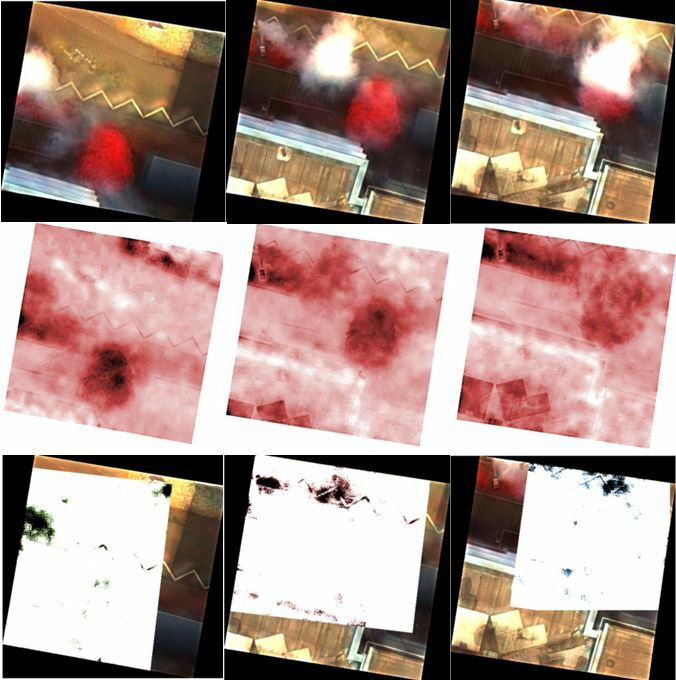 The result is shown in the picture below: Row one in Picture 2 is showing the chlorophyll cloud propagating from west to east through spatially referenced pseudo color pictures. Interesting is the underground partly paved and partly consisted of a grass strip. In the right picture the cloud covers a small tree. The TCI algorithm was applied on the three pictures in the middle row. Using a reference aerial photograph and building the difference to such an image (third row) one can find chlorophyll only detected on the asphalt, not on the green strip or the tree due to the fact that the method cannot distinguish chlorophyll from the plants from chlorophyll of the cloud. Wie ist die obige Erklärung zu verstehen? Geht es hier darum die Bereiche mit zeitlich konstant hohem TCI-Wert (= nicht die Chlorophyll-Wolke) auszuschließen? 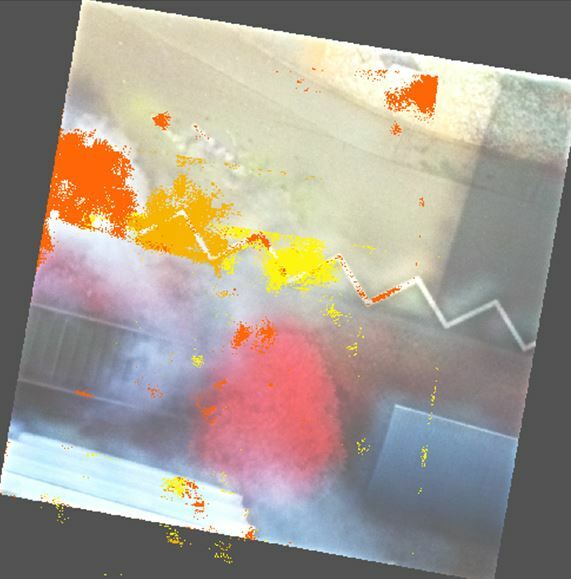 Picture 3 now shows the composition of the referenced and analyzed pictures with all three stages of the moving chlorophyll cloud. One now can see the grass strip and the tree in addition to the gas cloud over the asphalt. Picture 3: TODO: Eingefärbte Elemente detailierter erklären. A second experiment set was dedicated to a more general evaluation of cloud constituents. Here, the identification of constituents via logistic regression classification bases on the whole spectral range of the Cubert 185 UHD Firefly, in contrary to the previous example where the identification based on only three wavelengths. As a proof of concept, multispectral images of clouds produced by a fog generator fueled with two different fog fluids and solutions of each fog fluid mixed with defined proportions of chlorophyll (TODO: fog fluids genauer spezifizieren und chlorophyll-lösung) were recorded. In the experimental setup the Cubert 185 UHD Firefly was positioned facing a white wall in 1.2 m distance as constant background. The fog generator was placed between camera and wall in such a way, that the ejected cloud passed the camera in roughly 0.6 m distance while filling the whole recorded image plane. Immediately before each measurement set the incident intensity (white-balance intensity) in front of the camera was recorded by capturing the reflectance of a spectralon coated sheet at a distance of 0.6 m. By dividing the recorded reflected cloud intensities by the white-balance intensity the cloud reflectance was determined. The reflectance spectra of evaporated mixtures of fog fluid with chlorophyll not in all cases show the typical chlorophyll absorption minimum. Consequently, chlorophyll is not uniformly evaporated with the given setup but ejected in irregular chlorophyll bursts instead. Therefore, a TCI pre-evaluation was carried through on each pixel of all recordings of clouds of evaporated chlorophyll mixtures, in order to label positive chlorophyll spectra as training and test data for the logistic regression. After spectra inspection of several samples a threshold of TCI = 0.05 was chosen above which the spectra was labeled chlorophyll-containing. Spectra of evaporated chlorophyll mixtures with TCI < 0.05 were not regarded in the further analysis. The spectra of clouds of evaporated pure fog fluids provided the negative chlorophyll data. The table below shows the count of spectra for the different cloud categories that was used for training for the logistic regression classifiers in the next subsections. Based on this data different logistic regression classifiers were trained. 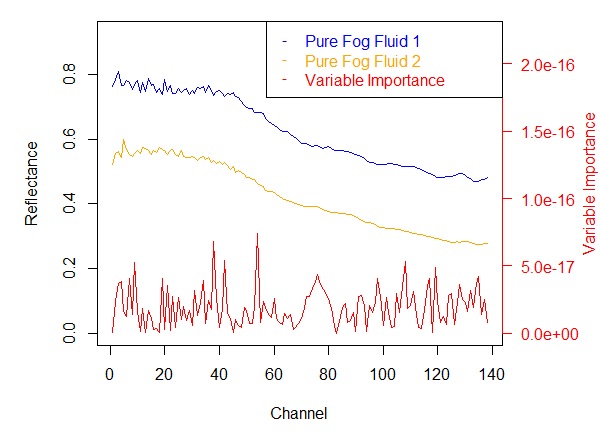 First a logistic regression classifier was trained to distinguish between spectra of clouds containing chlorophyll and pure fog fluid, irrespective of the type of the fog fluid. The figure above displays typical spectra for a cloud aof pure fog fluid and a cloud containing chlorophyll. In the latter case, the reflectance minimum due to the absorption maximum of chlorophyll can clearly be seen in the curve around channel 45. This also is the region where the variable importance (i.e. value of the t–statistic for each model parameter (= channel)) peaks and marks the most significant channels of the classifier. The high accuracy bases on the very clear feature of the chlorophyll absorption dip in the spectrum. Obviously this classifier is not robust against the mixture of features of another substance in the cloud. 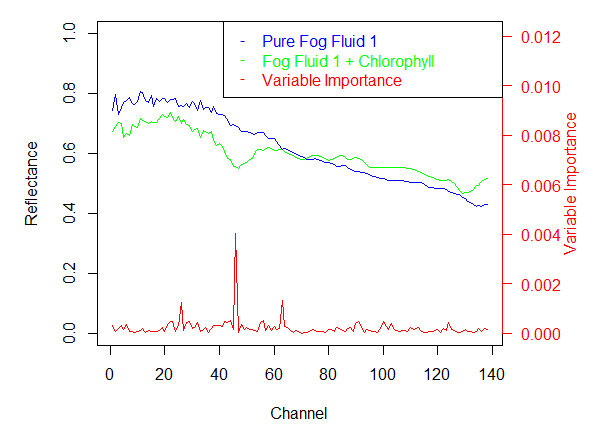 Interestingly, the performance on the test data of pure fog fluids is even slightly better when trained with data samples including mixtures with chlorophyll. This might be explained with overfitting in the case of training only with data of pure fog fluids (TODO diskutieren). The performance is rather convincing even though the spectra of the fog fluids are overlayed with the characteristic chlorophyll spectrum. It was shown that logistic regression can be used to identify constituents of clouds on basis of the reflectance spectra in the range of visible light with the here presented system, especially when strong characteristic features are present as in the case of chlorophyll. Besides that, even the identification of constituents with weaker characteristic features can be carried through as in the case for the distinction between the two fog fluids. For the latter case, the above findings suggest that the classifier for the constituent of interest should be carried through with data also regarding a variety of probable accompanying cloud constituents. Otherwise, the overlay of the different spectra might diminish the classifiers performance.